So we finally got beat...always a sore one to take especially at Ibrox. So much had been made of this being our first real test and though the manager played it down, it was true. The results are in and we lost 3-1 but we will learn from this and become stronger. The game reminded me of our clash with Hibs last February. Dominating the game with loads of possession and then being hit on the counter. Now we know how Lyon felt in 2007 when we won 3-0 playing the same way. It's something we'll come up against more and more but its a complement to how we play. Defensively we were pretty slack last night and we should have been better. The first goal was a punt up the park by St Johnstone with only Wallace trying to attack the ball but didn't get near it. Maclean then played a good ball to O'Halloran who beat Wilson down the right side and played a square ball which was flicked back and overall was a great move. For me someone had to win the initial header then failing that Wilson had to deal with O'Halloran's better. The second goal was criminal from Rangers as we gave them a free hit on goal and they bloody well took it - it was some strike! 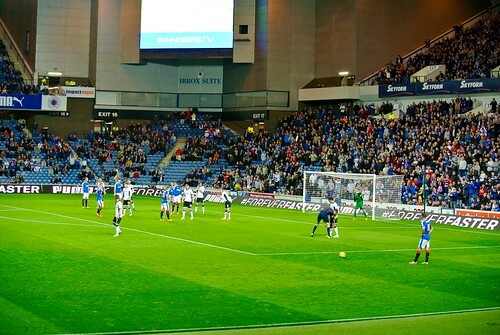 The players were set up but not to deal with how St Johnstone took that corner. We had six players in the box, three man-marking and three on the six yard line. We had Holt at the 18 yard line closest to the corner but not one person on Lappin. Hopefully when the team watch that back it never happens again. The third goal was a sickener even more so because it was just after half time. Yet again another punt forward this time from MacLean to O'Halloran who ran right between Wilson and Kiernan. It was like conceding a goal in FIFA with a striker with 85 pace smoking past your slow defenders. It won't be nice viewing for our centre backs but as I've said they'll learn from this. Even at 3-0 we just needed a goal and we were right back in this. 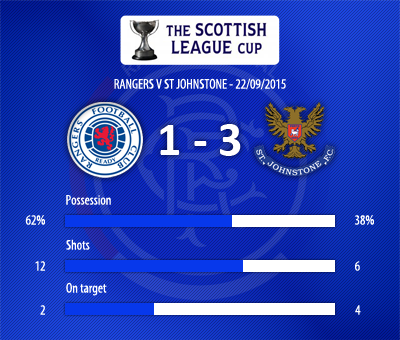 There was no way St Johnstone could keep defending like this for the full 90 minutes. I thought we had our goal when Oduwa smashed the bar but it just wasn't his night as it was probably his poorest game for us. Then five minutes later we got it through Tav. The blue Cafu with a great run beating two defenders and smashing the ball in to the roof of the net. The place was jumping and with just under half an hour to go I thought we would score more. Then Zelalem crossed for Waghorn and I was waiting for it to hit the back of the net but it somehow went passed the post. I thought we fizzled out in the last 20 minutes and had we got the Waghorn goal it could have been so different. I hate Rangers getting beat in any game but this is a blessing in disguise. I have the utmost faith that Mark Warburton and Davie Weir will identify our weaknesses in this game and make us stronger. Mark Warburton said he used a defeat to refer to through out the season at Brentford and this could be used in the same manner.